August 15, 2016: This Q&A post originally appeared on the LandlordsNY blog, where Michelle Maratto Itkowitz is the "Legal Expert". At the end of this post, I am going to give you the actual statute on this one, the New York City Housing Maintenance Code § 27-2013 (Painting of public parts and within dwellings). I think every landlord should read it and know what it says. Landlords often seem surprised by this statute. For those who simply will never read the statute, however, first I give you some major takeaways from the painting law. Note that while the HMC, in general, applies to all dwellings, certain sections of the painting section of the law apply ONLY to multiple dwellings, which means three or more residential units. • In a multiple dwelling (three or more units), landlord must paint every three years. • The lease can shorten this requirement, so be careful if you are cutting and pasting from some other lease! The lease can NOT lengthen the requirement. 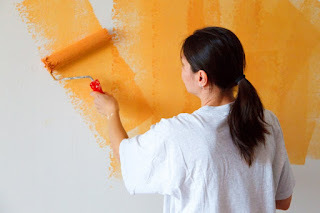 • Landlord can get out of the three-year-paint-job if ONE month prior to the expiration of the three year cycle the landlord and tenant agree that the painting requirement can be extended. In that case, the extension can be for up to two years. This needs to be in a separate agreement, however, not part of a lease. I assume this provision is there in case tenants do not want the hassles that come along with a paint job. • The landlord of a multiple dwelling is required to keep and maintain records relating to the refinishing of public parts and dwelling units showing when such parts were last painted or papered or covered with acceptable material and who performed the work. Such records shall be open to inspection by the department, and shall be submitted to the department upon request. Now back to your specific question! The fact that the tenant did the last paint job and the fact that he painted the place GREEN, has no bearing on the above-referenced law. You still need to paint the apartment, because it has been more than three years. Nevertheless, the lease probably prohibited tenant from doing his own painting and from using the color green. Your remedy there was to do a notice to cure lease violation – three years ago, or whenever you discovered this. It would be a hard case to bring now, because you have accepted rent since discovering the problem, thus waiving the violation. If a landlord accepts its tenant's rent without protest, after learning of lease violations, landlord thereby normally waives its rights to terminate lease on basis of such violations. Witkoff v. Shopwell, Inc., 112 A.D.2d 295 (2nd dept. 1985). Even more damning than that – he told you he was going to do it and you paid for the materials! Therefore, you have no remedy there for the green paint. Again, unless you attempted to terminate the lease for the damage caused by the crayons, markers, and stamps, at the time you discovered it, without accepting rent, then there is little you can do about it now. Understand something – Tenant may have “demanded” you pay for green paint, but you did not have to agree to do so! You did, however. I think that was probably a mistake. But that does not change the law or the tenant’s rights or the landlord’s obligations. Yes, failure to paint will get the tenant a rent abatement. Yes, you have to paint the place. Please read the below statute carefully, you have to paint all your apartments in a multiple dwelling and keep careful records thereof! I always encourage new owners, in particular, to go through each apartment, inspecting, repairing as necessary, removing violations, and painting. Not only will this eliminate possible reasons for tenants to have rent abatements in the event of a dispute with a tenant, but it gives owner a chance to inspect each unit thoroughly. In addition to complying with the law and being a good management practice, painting is an opportunity to look for possible grounds for eviction of bad tenants – such as non-primary residence, AirBNB/short-term-leasing violations, hoarding/nuisance, illegal alterations of the apartment, etc. (2) Repaint or re-cover the walls and ceilings with wallpaper or other acceptable wall covering whenever necessary in the judgement of the department to keep such surfaces sanitary. c. The department may require a tenant of a dwelling unit in a multiple dwelling to repaint or re-cover the interior walls and ceilings of such tenant’s dwelling unit with wallpaper or other acceptable wall covering if such walls and ceilings become unsanitary at any time within three years from the date of the last refinishing by the owner. However, if the tenant can show, to the satisfaction of the department, that the walls and ceilings have become unsanitary through no act or neglect of his or her own or of such tenant’s family or guests, the department may require the owner to repaint or re-cover the same. This subdivision does not relieve the owner from his or her duties under paragraph two of subdivision b of this section. d. The owner and tenant of any dwelling unit in a multiple dwelling may, by voluntary agreement, provide that the owner need not repaint in such unit as required by paragraph two of subdivision b of this section for such additional period, not to exceed two years, as may be agreed upon. Such an agreement to extend the time for repainting shall not be valid unless it has been entered into not earlier than one month prior to the expiration of the three-year period, and shall not form part of any agreement of lease. The department may prescribe the form of such agreements, require them to be filed, and may make such other regulations as may be necessary to avoid abuse, and to further the purposes of this article. Notwithstanding any agreement, the department may, during the period for which repainting is deferred by agreement order repainting by the owner in any dwelling unit when deemed necessary to keep the walls and ceilings of such unit sanitary. This subdivision shall not affect the applicability of subdivision c of this section during the three years after any repainting or re-covering. f. Nothing contained in this section shall be deemed to require the owner of a dwelling to cover with wallpaper or other acceptable covering any wall or ceiling not previously so covered by such owner. When a wall or ceiling of a dwelling unit has been decorated with paper, wood paneling, or other material over which paint normally is not applied, the owner shall be relieved of his or her obligation to repaint or recover such wall or ceiling so long as the same remains in a sanitary condition, in the judgment of the department. When the department requires redecoration of such wall or ceiling, the tenant shall remove any paper, wall covering, wood paneling or other material which such tenant has applied before the owner is required to clean and repair and repaint or re-cover. However, if the owner or a former tenant has applied paper, wall covering, wood paneling or other material, the owner shall be responsible for its removal before redecoration.